John’s Background Switcher has been steadily stockpiling some very nice wallpapers. With one downside of them being named by hashes of URLs. I tried to pester John about this, well I wasn’t convincing enough I guess. Since most of my wallpaper management is looking up specific pic or one of specific color I wanted some convenient way to navigate that pile for a while. Strangely there are zilch tools with even basic sort by color (Picasa is one of few). 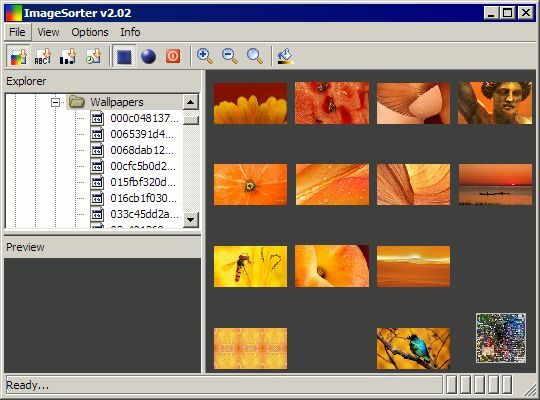 I had to practically raise ImageSorter from the dead with Wayback Machine and Google. App scans folder for images and displays them in overhead view, distributed by color. Such map of images can be dragged around, zoomed in/out and even turned into a circular globe-like view. Images can be selected individually or in bulk (mouse with Shift) and there are several actions for selection available from context menu. Main function works quite fine and being rare one (as it turned out) this is already nice. App is also quite snappy (tested on 600+MB worth of 1920×1080 wallpapers), it works with cache of downsized thumbnails, rather than original images. It also highlights duplicate or similar images nicely, but VisiPics is levels better for that. Ancient and huge pain to procure. Other than main function it is very basic and hardly convenient for generic image navigation and manipulation. It kinda does what I wanted, but is boring otherwise. Just doesn’t give that wow-this-is-nice-to-use feeling. I have no remote idea what that site even is. Grilled download through VirusTotal so it should be free of nasty surprises. If anyone knows something better for this – I’d be happy to check it out. I know this isn’t exactly the purpose of the post, but I laughed hard with the “I have no remote idea what that site even is.” I am careful about what feeds I read on the office, but I didn’t expect Rarst’s feed to make me chuckle. Though I don’t have another option to offer (away from my computers and without flash drive, can’t check my toolbox), I must admit I think it’s funny to sort wallpapers by colors – at least I’ve never seen people doing it that way. For me it always seemed logical to sort wallpapers by theme (nature, animals, animes, digital art, etc) and one special black and white folder. Just curious – how long did you search for this software? I don’t pay much attention to theme, the purpose of wallpaper is being there without being in your face (something many fanboys of Apple should learn, wallpapers with giant glowing apples receive instant “never show again” from me). I mostly like pure bright colors and interesting textures. So for me moving by color is fastest way to get to specific pic I remember. How long for app overall or for download? For app quite fast, it made a round over all usual tech blogs couple years ago so pops up in searches fast. Download took maybe half an hour (for decent latest version). I was checking file portals, then gave up, looked up developers page in archives and googled for exact file name. It’s been a long time since I used it, and I have not yet tried ImageSorter, but might I suggest Photology? It also has the option to sort by color (and more). Yep, that was another candidate… But just as old and semi-dead. I simply got to ImageSorter first. Thanks for suggestion anyway! I think it’s worth checking out also. Seems ImageSorter just doesn’t cut it for regular use for my taste. Thanks for info, will try to take a look at latest version. Me and a friend already sent a bunch of bug reports for the Win and OS X version of Imagesorter, so you can expect it to become healthier in the near future. I really like the donation system, where he meticulously lists the hours he has worked on each application. Bookmarked to check out. For finding duplicates I am using VisiPics (for a long time already).